While there are many advanced statistical packages out there you don’t need them to perform a detailed and comprehensive analysis of your survey data. You can use the same techniques and approaches in Excel and in this post, I’ll take you through how to analyze survey data in Excel. Excel is a very good tool to use for your analysis and has the benefit of being on almost everyone’s desktop. With a little bit of insight, you can do almost everything the statistical packages can do in Excel. Don’t fall into the trap of thinking it’s an inferior tool. When analyzing survey data there are surprisingly few different types of questions you need to answer. If the responses for one question / customer segment are significantly different from the responses for another question /customer segment. If the responses for one question are changing over time. If the responses for one question are correlated (implies causes / is caused by) another question. This is good news because there are only a few types of statistical approaches you will need. Please tell us what you like most about our widget. We are going to focus on Number data in this post. Perform correlation analysis to see if two variables might be linked: mostly on outcome variables and attributes. In the rest of this post I’ll show you how to undertake each of those tasks. Generating simple statistics for your data, mean, maximum and minimum, is quite easy. In the image below we have included the standard maximum, minimum and average along with a couple of additional statistics: Standard Error and 1.96 x Standard Error. We’ll use these statistics in the next section when we graph the scores add confidence intervals for the average. Excel has formulas for each of these and is smart enough that you can simply highlight an entire data column and it will calculate the statistics for you. When you present your data you will almost certainly use charts. So, the next step is to graph the average of each question. However, one of the problems with most feedback charts is they show the average as one number. This can be misleading because the response average is only an estimate of the population average. With a couple of simple steps, you can add Error Bars to your charts to show the 95% confidence interval – which is much more informative. The standard error of the sample mean is an estimate of how far the sample mean is likely to be from the population mean. When we multiply it by 1.96 we are creating a 95% confidence interval. In other words we are 95% confident that the actual average for all customers is between the upper error bar and the lower error bar. Here is a quick video on exactly how to do that. Before you go on to more advanced statistics you should also create histograms of them to better understand the data. Histograms show you the proportion of different responses to a question and can be used on Number and Categorical data. They are very useful because, while averages can be interesting, they can also hide a lot information about the responses. Are the responses nicely spread around the average or skewed to one side or maybe there are there two peaks? While each sample might have the same average, they can have very different looking histograms – and seeing those histograms can help you more effectively interpret the responses. First, you’ll need to create a set of “bin” values. Typically, your survey response scale will use 0-5 or 0-7 or 1-7 or something similar so your bins need to cover each of the score options. Now you have the bins you can create a histogram for each of your survey response. This short video shows you exactly how to do that. Now, if your histograms show a relatively nice “normal” distribution curve, you can use some more advanced statistics to add value to the data. See below for the histogram from the example. You can see that it has a nice even shape with just one peak. It looks normally distributed (the “bell curve”) so we can carry on with the more advanced statistics. The t-Test allows you to test if the average for one set of scores is probably different from the average for another set of scores. So, you can use the T-test in all these areas. I’ve already written a detailed post exactly how to use the t-Test on survey responses so I’ll refer you there for the details. Note: there are downsides with just comparing everything with everything. Think about it for a few seconds. If you set your test so you have a 95% confidence level and you test 20 different pairs of responses, on average, one of them will show a positive test just on random chance (5% chance). There are ways to overcome this problem but they are outside the scope of this post. So, in general take care just comparing everything with everything – do it deliberately. Cause and effect is the focus of this section. For instance: does our Net Promoter Score go up, and down as our Responsiveness score goes up and down? You have probably heard the saying that correlation does not imply causation and it is true that you need to be careful not to over emphasize the impact of a high correlation. However, it is also true that correlation does not deny causation. It’s a good place to start your investigation. When investigating correlation, start by looking at how your survey outcome question correlates with your attribute questions. Creating the chart below for each of your attributes is a good place to start. Attribute questions that correlate highly with the outcome question are good candidates for key business drivers. The easiest way of calculating correlation is to simply graph your two data sets and ask Excel to add in the “Linear Trend Line”. This has the advantage of also letting you see the data so you can determine if the data looks right, i.e. one or two points are not skewing the results. Again I have a short video to help you on this. The correlation coefficient (R) indicates the correlation between the two values. R = -1 is a perfect negative correlation, a move up in one variables correlates to a move down in the other. So, the closer 1 the better the correlation and you can generally ignore anything less that about 0.3 for this value. Excel shows you the R-squared value. This number indicate the percentage of variation in that one variable explains variation in the other variable. In this post I’ve outlined simple process for using Excel to analyze survey data. 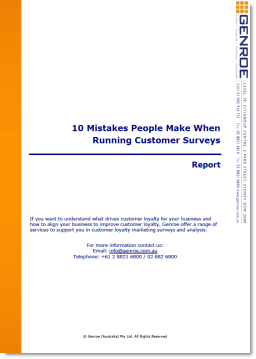 If you follow it you’ll be ahead of many people’s survey analysis and on your way to correctly interpreting what your customers are telling you. Thanks for the post Adam, most informative. To those who are interested in the text analysis of verbatim collected from surveys, I recently summarised my explorations using excel to do so. I feel it compliments this post nicely. Thanks for stopping by to comment. I checked out your page — you have some nice approaches for text analysis using Excel. I’m sorry I don’t understand the question you are asking me. Are you able to provide some more clarity on what you are trying to achieve. I ran a survey which got 661 respondents and I have the clean data in tabs in excel by segment that we are targeting. I have both the actual # of respondents per question/answer as well as broken into percentages. There are a few questions that I am looking to answer regarding who the buyer of said product is (age, gender, sports & activities participated). Where they are shopping for lifestyle clothing as well as were they expect to find it. What would be the best approach to using the survey data to answer these questions? How would you approach this business issue through the data from the survey? Sounds like you have the data ready. Unfortunately it’s very difficult to outline exactly how to use the data without seeing and knowing the questions you’re trying to answer. A simple bar chart of the different values could work and well as an over/under representation by group. I hope that helps a little. Hi Adam, I think the link is broken as it takes me to a how to do NPS excel sheet versus a sheet showing how to do excel survey analysis. Could you update the link or send me the excel referenced above? Thanks in advance. Thanks for letting us know. You were right — the link went to the wrong download but it’s been fixed now. Thanks for the insights provided on the subject matter, Adam. It appears to me that I would also find it useful for academic research too. I hope you would be there if I should get stuck anywhere along the line. Thanks for dropping by but I your question is a little to general for me to assist you. I am creating an Anti-Bullying Program and we will be conducting several types of surveys about bullying in the School, the effectiveness of the program we plan to implement, collect data on how many bullying incidents are reported, not reported etc. Do you think Excel would be sufficient enough for us to use? It depends on your data size and analysis complexity but as you say “the school” I’m assuming there will be less than 10k data points. I would say Excel will be fine. You can do a lot in Excel. The only difference to the more high priced applications is that you have to do a lot of the things manually, but for smaller datasets that is often an acceptable tradeoff. Thanks for dropping by. Unfortunately I can’t provide advice at this level of detail in this forum but I hope you are able to achieve your goals.